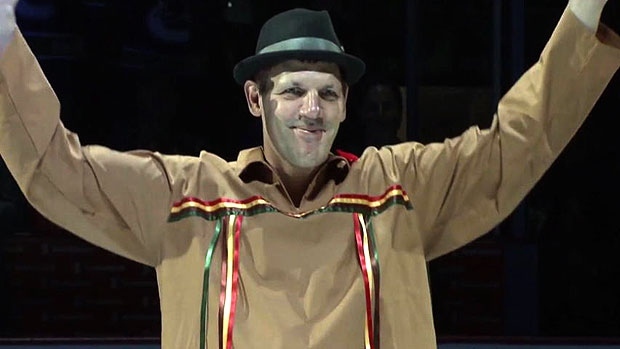 Gino Odjick at Pavel Bure’s jersey retirement ceremony. It was heartbreaking to read about Gino Odjick last night. It was even more heartbreaking to read his letter to his fans. It’s just hard to picture the guy with one of the biggest hearts in the game now battling a terminal heart disease and may only have weeks to live. Gino has always been a big favourite of mine. I started watching the Canucks in the early 90’s and worked for Orca Bay for almost a decade starting in the mid-90’s. As many players and team personnel from that era have already commented, Gino was the ultimate teammate and a great friend. He was someone who exemplified everything we ever wanted a Canuck to be. As fate would have it, the Canucks were playing the Islanders the day after Gino’s trade. That night, I was working in what was then the Air Canada Club section at GM Place. When both first took the ice, the crowd roared. And then, Gino dropped the gloves against Struds, and GM Place exploded with “Gino! Gino! Gino!” chants. The Canucks were awful that season – they were on their way to a 25-win season – and it wasn’t uncommon for large pockets of GM Place to be empty. But that night, the building was unusually full for that era. The funny thing was, it was full, not necessarily to cheer on the home team, but to welcome back Trevor and Gino. And man, did they ever. Canucks fans always loved Gino. And how could you not? He gave his heart and soul to this team and this city. He gave his time to his community and inspired many Aboriginal children to follow their dreams. As word of his disease has come out and you read many of the tributes written for him today, it’s obvious the feeling is mutual. Gino, we wish you the best and we thank you for being a Canuck. Rest assured that we’ll be next to you as you fight this disease as you were always there to stand up for us.